This character is a Pack NPC of Casa di Cavalieri. For more information regarding pNPC roleplay within Casa di Cavalieri, please see the board-wide NPC procedures. This character is available for adoption! See Casa di Cavalieri's Adoption Information. Darius is an original, don’t let him catch you thinking otherwise! 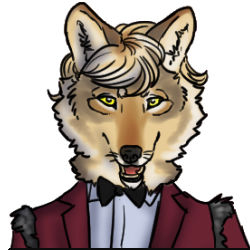 This coyote flaunts around with a skip in his step and a sly smile, showing off his latest clothing creations. He spends much of his time designing new outfits out of old clothes, ensuring he is always the best dressed. At a young age, he took to Tessa Raskin, who protected him from all who teased him throughout his youth. He still holds onto the concern that others won’t like him, so he has made it his mission to become best friends with everyone, learning everything about everyone around him, and building relationships through the offering of knowledge. Be careful, this information is not always used in innocent ways! Darius was introduced to Casa di Cavalieri during the Syndicate Revenge Conflict in 2017. Originally from a pack in Portland, she and Darius Pierson were sent from their home as scouts to investigate rumors of ex-members forming a gang in Halifax that called themselves the Syndicate. Having a love for adventure and flare, Darius had them join the Syndicate under the lie of having abandoned their old home. During this infiltration, the Syndicate attacked Casa di Cavalieri, and, seeing the opportunity Tessa and Darius, switched sides to put an end to the gang's behavior. After helping Casa end the Syndicate, the pair got to know the Cavaliers while healing from the battle. Due to the pack's strength and eagerness to help those in need, the pair decided it was time for a new adventure and joined Casa. Within Casa he has earned his job as a Tailor, creating masterpieces of clothing for those who can pay, and sometimes simply to show off his work. He has also taken to being one of the faces of Casa's pub, The Five Shields, as he can serve a drink to the Cavaliers in their time of need, and collect information on them for later. Attention Seeker: Always one for flair, Darius tried his best to be the center of attention whenever appropriate, and sometimes when it is not appropriate. This usually comes in the form of seeking praise for his work, insisting his contribution to the pack is superior, or making a dramatic scene. Quick Tongued: Darius sometimes struggles to hold his tongue. In fact, his snarky comments and quick come backs have earned him as many laughs as they have glares within the pack. He can also be quite the charmer when he wants something. Gossip: He has a love for collecting tidbits on those around him. He isn't sure why exactly, but it could be that having the information makes him feel like part of the drama. Unfortunately, he is known to let your personal information slip, but, if you need to know what is going on in another canines life, he comes in handy! Adventurous: The main reason Darius traveled from his home in Portland, joined a gang, and then dramatically turned against them in the name of justice, is the same reason why he joined Casa: he loves adventure and drama. Although he is not exactly a thrill seeker who would put himself in harms way, he does love a good story and likes to be at the center of it. Tailoring: Since he was a young boy, Darius has always loved clothing. While others may think of clothes as restricting and unnecessary, Darius believes clothes to be a beautiful expression of the self. He began to experiment with cutting and sewing various fabric after shifting, and has since learned how to create some show-stopping pieces - though, he is always pushing himself to create even more beautiful clothes at the expense of comfort and practicality. Word Craft: Darius can be a slick smooth talker to earn your favor, and your information, when he wants. He is very charismatic, but often has a habit of letting his mouth loose when it means making a funny quip. Weapon: Darius uses two small daggers when fighting. None currently created, can be discussed. Tessa Raskin: His protector in his younger days; she was his travel companion sent to help keep him in line while the pair investigated the Syndicate. All of Casa di Cavalieri.